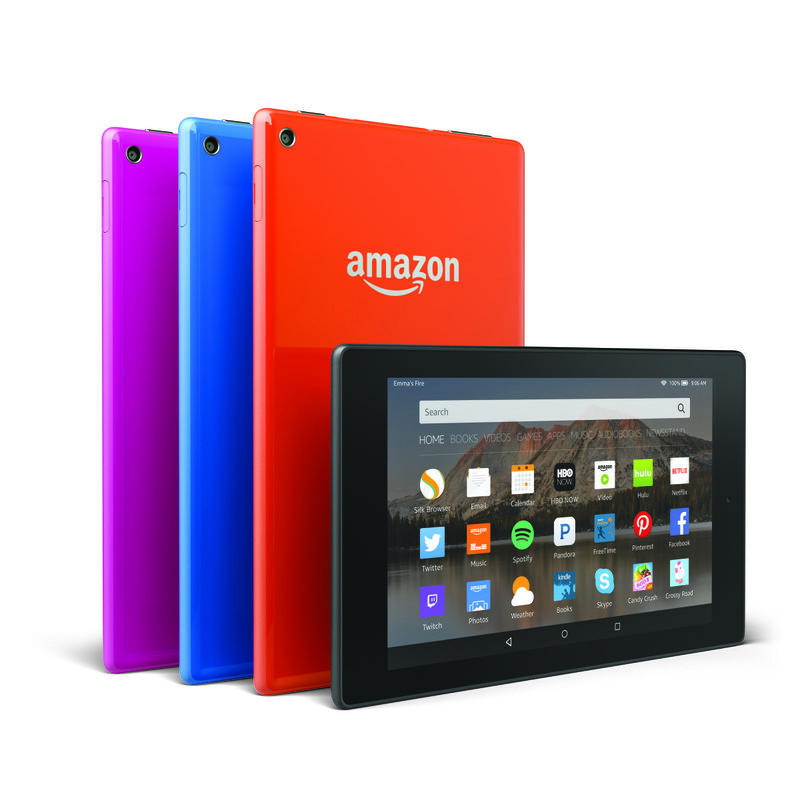 In its line of Fire tablets, Amazon operates on a core principle: we’ll give you a great tablet at a low price, as long as you are willing to pay over time in the form of purchasing the vast amount of digital and physical content we have available. The company’s latest line of hardware, the Fire HD 8 and the Fire HD 10, are the peak expression of this philosophy. Both offer good hardware and lots of splash for $149.99 and $229.99, respectively, on the premise that you will be spending all the change you pocketed on movies, games and books on Amazon as well as monthly services to boost your overall experience. In short: if you’re willing to play on Amazon‘s turf, it’s upgraded its facilities nicely. If you’ve seen an Amazon tablet before, it’s highly unlikely that you will be shocked or wowed by the appearance of the HD 8 or HD 10. Both models are definitely shaved down compared to the Fire HD 7, although they still have thick bezels that eat up plenty of screen area. The HD 8 comes in a variety of “fashion colors” — my review model is a magenta — while the HD 10 only comes in black or white. No color does well to downplay the plasticky sheen of either models, which looks a little cheap by itself. Luckily, that can be mitigated fairly well with Amazon‘s cases, although it is an added expense. When you get down to brass tacks, the main thing you are paying for with the Fire HD 10 is size. Both tablets have the same thickness (7.7 mm) and a a quad-core 1.5 GHz processor to power it all. Both also feature 5MP rear-facing cameras, as well as front-facing HD cameras. Although they both maintain 16:10 aspect ratio displays, the Fire HD 8 looks a little sharper with 189 ppi versus the HD 10’s 149 ppi. The battery life is listed as up to 8 hours for both, but in practical use it has spanned me several days, since I find myself using it for what I assume Amazon wants it to be used for: consuming media. Both tablets come with the new Fire OS 5 “Bellini” software, a version of Android largely designed around the different content you can buy through Amazon. Movies, TV, Books and Games are all sorted by what you own and what you could own. Because it’s so media-focused, you’ll be paying more attention to that than the actual apps you can download. This is a good thing, because Fire tablets are still largely locked within the Amazon app ecosystem. Both tablets provide for sideloading, however, so you can put apps and other media on the tablet if you choose. It just requires more tinkering — something the average Amazon user might not bother with. There is a standard home screen that includes all of your available apps. So, if you wanted to, you could use your Amazon Fire to browse the Internet, use Maps, or other features. But, to be honest, you’ll find very little opportunity to use them in favor of what the OS does best. Unfortunately, the worst thing about the Amazon‘s OS is its lockscreen. If you’re tolerant of ads, then you probably won’t spend $15 to get rid of them on your lockscreen. But if you’re not, prepare for it to be an added expense. For a cheap tablet, both the HD 8 and HD10 run smoothly and with few hiccups. While many of their strengths are common to the both of them, there are some things to keep in mind if you’re weighing between the big tablet and the smaller one. The Fire Tablet handles your Amazon book library like a champ. Reading through books is still the same pleasurable experience Amazon has manufactured in its other tablets and e-readers, so you won’t find any surprises here. Both tablets sync seamlessly from device to device, so you won’t have to worry about jumping between devices while reading. If you’re a bookworm, the HD 8 is probably a better device for you, since it is more portable. However, I did experience a little screen discoloration on the HD 8 versus reading on the HD 10. Viewing movies and TV is also enjoyable. Amazon already comes preloaded with Prime Video if you have an applicable account, and will recommend content accordingly. The dual-band WiFi also meant that streaming was a lot more powerful and seamless, so it’s easy to curl up and bingewatch. The aspect ratio also makes for a neat letterbox effect, so you can see the whole image. The bigger tablet has the advantage in streaming, but the HD 8 has a slightly crisper look overall. Another great plus is the introduction of Amazon Underground, in which Amazon picks up the tab for otherwise Freemium games. This a boon for gamers who’ve always wanted to know what it’s like to pay for upgrades but have been too chicken to pull the trigger. Amazon Underground also offers a library of select premium games, like Goat Simulator, to try for free. Gaming is decent on both tablets, but still feels a little like an afterthought amid other content. Underground also doesn’t have the marquee titles you might expect to play for absolutely free, so don’t expect to plow through ‘Candy Crush Saga’ or ‘Kim Kardashian: Hollywood’ without purchasing items. Parents will enjoy the built-in FreeTime mode for kids, allowing little ones to enjoy content without the worry that they’ll be buying seven seasons of Spongebob Squarepants while you’re not looking. And both tablets have access to Amazon‘s MayDay in case of hazards. If you want to get the most out of your tablet, be prepared to spend real money on both monthly subscription services and individual pieces of content. In Amazon‘s world, you still really can’t have both. Both tablets have a handful of subscription services available to tempt you into paying regularly for content. Of course, there’s Amazon Prime, and quite frankly, if you aren’t a Prime member you have no business owning this tablet. So much of the content that is advertised is exclusively for Prime members, who also get access to music, the Kindle Lending Library, and other such goodies. Without these things, the tablet will languish in your junk drawer. But even Prime members might be a little peeved at how many extra subscriptions are available for the tablet. There’s an Audible subscription if you like audio books, and Kindle Unlimited will offer you access to (very) limited books for $9.99 per month. There’s also FreeTime Unlimited, designed to load content exclusively for kids (separate to Prime). This is all on top of the Netflix, Hulu, HBOGo, Spotify and other subscriptions you may want to enjoy on the tablet, which can rack up easily. If that weren’t enough, Amazon often recommends content you must purchase in order to enjoy. And it’s inevitable that you’ll do so, as most of these subscriptions don’t provide the content you really want. If you’re not careful, the content purchases alone will catch up to you. If you’re already playing in Amazon‘s sandbox, or have no qualms hopping right in, then there’s a lot to love about the hardware and software on the Fire HD 8 and Fire HD 10. They’re perfectly tuned to provide you with content that you want to consume. But in a lot of ways, it doesn’t offer most features that I would want in a tablet — I don’t feel like turning to it to browse the Internet, take care of email, or fiddle around on Facebook or other social media sites. I use it to consume content first and foremost, and leave productivity to my other devices. It also doesn’t help that Amazon doesn’t provide a great experience with its Silk browser, which lags in practically every way compared to Chrome or Safari, and its proprietary mail app. These things feel like afterthoughts because they are afterthoughts. It’s also hard not to feel like you’re paying for every minute of the experience after you turn one on — you’ll be spending a lot of money just to access the things you want to enjoy, or spend your time coveting things your inner conscience won’t let you buy. Bottom line: if you’re looking for a cheap tablet and can learn how to cope with (or bend) Amazon’s rules, both the HD 8 and HD 10 are great choices. If you can’t, then I suggest you look elsewhere.